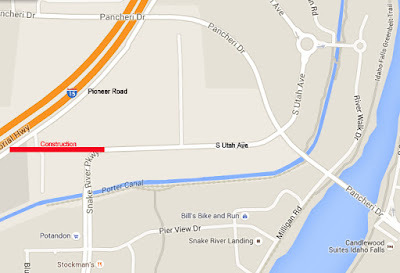 Here's a map to explain what's going on south of Pancheri Drive. 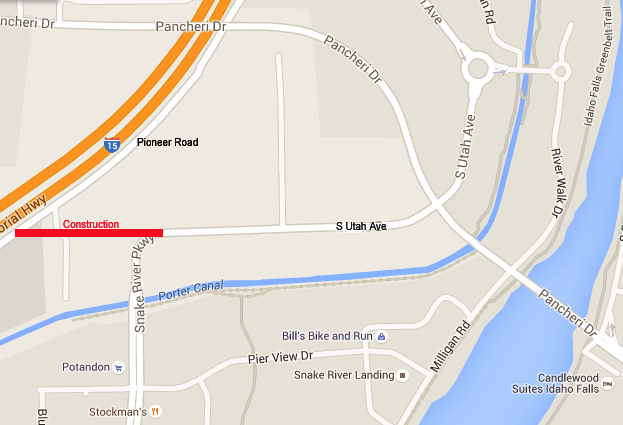 You may have noticed a lot of road construction south of Pancheri Drive on Utah Avenue. That is because the city of Idaho Falls is building a road connecting Utah Avenue to Pioneer Road and “T” intersection that will connect those two roads to Snake River Parkway. The intersection will be right where Utah Avenue (formerly Crane Drive, which is no more) jogs left to become Snake River Parkway. City Planner Brad Cramer said they plan to have the asphalt laid before the hot mix plants shut down for the winter. Curb and gutter work will go on during the winter and landscaping will take place in the spring. All this work is taking place on land in urban renewal districts, which means the money collected from taxes on new building can be put back into the local infrastructure. The city established the 55-acre Eagle Ridge Urban Renewal District last December after the $3.5 million Guns and Gear opened its doors. Owners Dixie and Shane Murphy and their partner, Ryan Later, spent $2.8 million on the two-story, 15,000-square-foot building, which overlooks the Snake River Landing development, and this provided the impetus for the city to establish a district that allows is tax increment financing through the Idaho Falls Redevelopment Agency. Put simply, while taxes are collected on the land the way they always have been, money collected on improvements to the land goes to the Redevelopment Agency to be spent on roads, water, sewer and power lines in the district. Most of the development we’ve seen along the river since the Shilo Inn was built in 1988 — Snake River Landing, Taylor Crossing on the River, Candlewood Suites, Hilton Garden Inn, etc. — has been made possible by tax increment financing. The land would be too expensive to improve otherwise. Yes, it does, although the widening of Pioneer Road from Sunnyside north also has to be done.